Keep control of your stream! From a desktop to a tablet, a uniq interface to manage your Photo Stream, Video Stream, Tweeter stream. Stay in control of your brand by moderating photos either before or after they are published on sharypic or broadcast live on the PhotoWall. 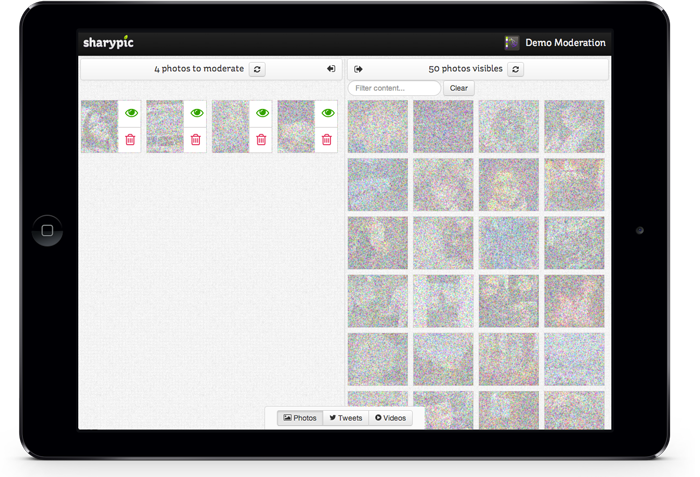 Explore our moderation settings and filters, or create your own custom filters. Manage the PhotoWall direct from the venue with our Content Control Dashboard. Optimized for tablets, you can show and hide photos in just one tap.